​Kal Lavelle is an Irish born singer songwriter now living in London. Her songs are instantly captivating, with a voice that Alex Zane (Channel 4) praised as simply "beautiful". Kal began playing guitar after winning a £1000 in a Mars Bar when she was 10 yrs old. With the money, she bought her mother a washing machine and for herself, her first guitar. Kal's debut EP ‘Shivers’ climbed to #5 in the iTunes UK Singer/Songwriter chart. The iTunes US & Japanese stores also featured her in the 'New & Noteworthy' section. This in turn led to her song 'Breakfast At Tiffanys' being chosen as 'Single of the Week' on iTunes in the UK (Downloaded over 60,000 times). ​'Breakfast At Tiffanys' went top 10 in the Singer/Songwriter charts in three countries, iTunes Japan, iTunes Netherlands, and iTunes Belgium, it also charted in iTunes Ireland and iTunes Finland. Three of her tracks have featured on Tom Robinson's BBC RADIO 6 show & her song 'Downstairs' was selected for the BBC Introducing Podcast. 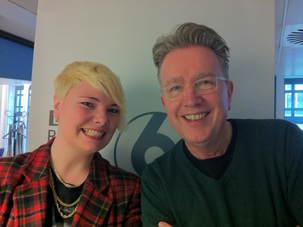 She was also a special guest on BBC Introducing, which was broadcast Nationwide. 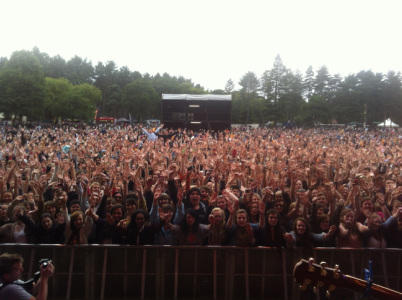 View from the stage as Kal Lavelle supports Ed Sheeran. Ed Sheeran took Kal on tour in the UK & Ireland in 2011 and asked her to support him at his biggest headline show (thus far in the UK), Thetford Forest, Suffolk, in 2012, playing to 10,000 people. On the 1st of Jan 2012, the Sunday Mirror (UK National Newspaper) listed Kal in their "Hot for 2012" Ones to watch list. Festival slots were to follow, including Latitude Festival, Stummerville Festival and headlining the acoustic stage at RedFest Festival. Further highlights of 2012 included Kal's first television synch on the soundtrack of BBC drama 'Lip Service' and supporting the incredible 'Bastille'. Perez Hilton's Pop Up #2 Compilation Album. In Nov 2012, Perez Hilton discovered Kal's music & featured her on his website, calling her music - "Exquisitely beautiful & raw, it's as if she's talking directly to you!". 2013 began with the music site 'Music Is My Drug' placing Kal on their 'Ones to watch' for 2013 list. Her OntSofa session of 'I Fell In Love With My friend' surpassed 40,000 hits on You Tube, (residing in the Top 10 most watched videos on their site) and the well respected 'Balcony TV' featured Kal in their "Global Show Of The Day" section, which was highlighted across the Balcony TV network around the world. 2013 also saw Perez Hilton selecting Kal's song ‘The Ocean’ for inclusion on his Pop Up #2 compilation album (released in United States & Canada on May 14th 2013), alongside songs from Lianne La Havas, Paloma Faith, Tegan and Sara, Bastille and more. Perez says of the track: "I wanted to end Pop Up #2 on a sweet and romantic note, and this song is just so exquisite, hopeful and filled with love." ‘The Ocean’ is also available worldwide as a Single on iTunes & Amazon. Near the end of 2013 Kal ran a Crowd Funding campaign to raise money to create her next EP (she raised 51% in the first 24hrs and raised 100% on day 23 (the campaigns length was 60 days). In the end, Kal raised 137% of her intended goal. In 2014, Kal played Amsterdam Coffee Festival in the Netherlands, the upmarket Harrods in London, played a guest performance in Quicksilver's Paris store, played her first USA show in Rockwood Music Hall in New York, travelled to Palestine to perform at Bethlehem Live Festival and embarked on a SOLD OUT Double Headline tour of the UK with her friend and fellow musician Fiona Bevan (Global Number 1 hit writer "Little Things"). In Sept 2014, Kal also completed a double headline tour, this time in Europe with friend Zoe Konez (Big Chill records), playing shows in ﻿Germany, Switzerland and Austria﻿. They were also invited by Amsterdam FM in the Netherlands to play a live session and were interviewed live on air. In October 2014 the BBC premiered Ten Pieces, a Nation Wide project featuring Kal Lavelle & Fiona Bevan giving their top tips on songwriting to 7-11 year olds. This was shown in schools all over the UK. 2014 also saw Kal Lavelle's track ﻿﻿'The Ocean' playlisted in﻿ Pret a Manger stores all over the UK﻿. Flash to 2015, Kal embarked on a 17 date tour of the UK & Ireland with Lucy Spraggan. 17 dates in 23 days, covering 4 countries. This saw her Shivers EP re-enter the iTunes Singer Songwriter charts. Also in 2015, Kal's EP reached number 25 in the Malaysian iTunes chart. A massive highlight in 2015 was The British Library requesting to place Kal Lavelle's music in the British Library's Sound Archive, the email said - "with world class facilities at hand we can provide the safest possible home for your releases, both for preservation and access". You can now find Kal's music in this historical emporium "for many generations to come." In between writing, touring and curating events, Kal has finished the recording of her next record. Once intended to be an EP, it has now turned into a full length debut album. The first single 'Blue Lagoon' from her forthcoming album was released on 31st January 2018. It was produced by her friend & long time collaborator Peter Lyons & mastered by Aquarius Mastering in Berlin. Blue Lagoon topped the charts in two countries, reaching Number 1 in Irelands iTunes Singer Songwriter Charts & Number 2 in the UK's Singer Songwriter Charts! Blue Lagoon will also feature on the Next Big Thing show on all British Airways planes from May 2018. "An absolutely beautiful new song from the wonderful KalLavelle. She has never sounded better" - Stephen Foster (BBC Suffolk). 'Get Out Of My Head', the second single from Kal's forthcoming album was released on 28th Feb 2018 and reached #2 in Ireland's Singer Songwriter Chart & #3 in the UK Singer Songwriter Chart! Kal's singles have garnered plays on Tom Robinson's BBC 6 Music Show, BBC Introducing, BBC Suffolk, Rare FM, Radio Warwickshire, Laurel Canyon Radio (USA) & WMSC-90.3FM (USA)! Kal's Sold Out album launch took place on Friday 1st June 2018 in the beautiful St Giles in the Fields Church, in central London. Kal's new album (was released worldwide on Saturday 2nd June 2018 - http://hyperurl.co/kallavellealbum) 'For The Loved And Lost' hit the Top 5 in five countries iTunes Singer Songwriter Charts (Japan, UK, Ireland, Hong Kong & Switzerland) and Top 10 in France! The album also topped the Hong Kong iTunes Singer Songwriter Album charts at Number 1! A UK & European tour will follow later in the year. Please visit www.kallavelle.com for more details. 'The Ocean' single - https://itunes.apple.com/gb/album/the-ocean-single/id642403762 (it's also on Amazon). SIGN UP TO KAL LAVELLE'S MAILING LIST! Be the first to hear about Kal Lavelle's new Exciting news!